There are stories about Ludlow football, and Ludlow softball, but here is the first story about Ludlow fencing. Above Wynners Cup Cafe on Elm Street the sound of feet shuffling and swords clashing can immediately be heard while walking up the stairs to the Northern Kentucky Fencing Academy led by expert fencer Ned Kalapasev. There you will find many young people, all dressed in white protective clothing and black screened helmets, sword-fighting one another, and standing above them all is Kalapasev, instructing them on the finer points of the sport. The basics of fencing are easy: two fencers must stay in a narrow lane, either attacking or defending and when one is struck with the tip anywhere on the body, a point is awarded for the touch. Both fencers can simultaneously touch, each getting a point in the process. The first one to five touches wins the match and touches are determined by a small spring tip on the end of the sword that when pushed in far enough, records a point through an electronic sensor attached to the sword. From there, though, it gets complicated. There are different types of swords that come with different types of rules. The sword that the academy uses is called an epee. The NKY Fencing Academy has been in operation since 2011, but has been in Ludlow only one month. Previously, the Academy would sublease dance studios and volleyball courts in the area before finding its first full time location on Elm Street. It has 40 active students, and during the season, offers two practice nights a week. This week, though, Kalapasev put on a week-long camp while the offseason is still under way. 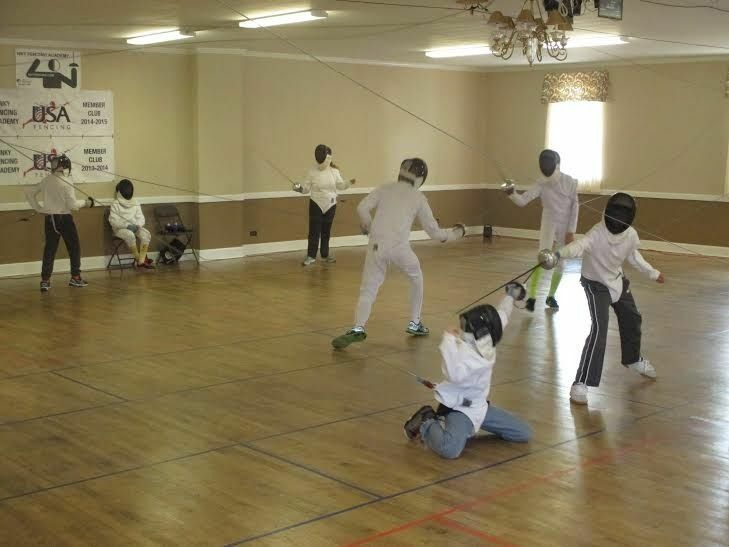 During the season, there are tournaments among cities that have fencing clubs. Previously, the NKY Fencing Academy had to travel to other teams’ home studios, but now that there is a fulltime space available, Kalapasev intends to host tournaments in Ludlow as well. The Academy is part of the US Fencing Association which is the governing body of the sport within the United States. Students of the Academy must be a member of the Association which costs $5 annually per person, but to compete in circuits costs $70 annually. Then there is an additional fee to be a member of the Academy which the cost is determined by how much the student wants to fence. Students can sign up for group sessions or one-on-one sessions with Kalapasev or both. Ages for fencing students typically begin at nine and go up to adult ages. Kalapasev said that his adult program has petered out some over time but that he is receptive to teaching interested adults. Kalapasev also said that he would like to do classes designed for military veterans as well. Larger cities like New York and Chicago have strong veteran programs. The sport is mixed between men and women and all of the gear at the Academy is provided to the students. NKY Fencing Academy has 50 sets of gear. If a student decides that he or she would like to compete on a serious level, then that person must purchase her or his own gear. Kalapasev is a native of Serbia where he learned to fence and was ranked in the top-10 of fencers under the age of 20. He later moved to England where he met his wife who is from the Northern Kentucky area. Once married, the couple moved to the United States where Kalapasev attended the University of Virginia and became state champion. Now he is mostly a fencing instructor, but he is also a husband and a father. As a father, he uses tournaments to raise awareness and funding for a heart disease called Barth’s syndrome which his five-year old son has battled since birth, requiring a heart transplant. Kalapasev joined in with a club from Dayton, Ohio last year to do a tournament to raise awareness and money to combat Barth’s Syndrome and hopes to have a regular series of similar fashion. It’s easy to identify the passion that Kalapasev has for fencing and for his students, and those who receive his instructions seem to thoroughly enjoy themselves while they’re there. One parent said that she drives her son over 30 miles each time they come to the studio because of how much she appreciates Kalapasev’s tutelage. Those interested to learn fencing or learn more about the NKY Fencing Academy should visit nkyfencing.com for more details.